Bellevue Wolverines Varsity fell behind early and couldn’t come back in an 8-2 loss to West Seattle on Monday. West Seattle scored on a double by Lucy Mead in the first inning, a groundout by Sofia Sallas in the first inning, and a stolen base by Anabell Watt in the second inning. The Bellevue Wolverines Varsity struggled to contain the high-powered offense of West Seattle, giving up eight runs. West Seattle got things started in the first inning when Mead doubled on a 3-2 count, scoring one run. West Seattle scored five runs in the fifth inning. West Seattle offense in the inning was led by Parker Ellingson, Mead, Sallas, and Sofhie Wimer, all driving in runs in the frame. Watt earned the victory in the circle for West Seattle. She lasted seven innings, allowing four hits and two runs while striking out eight. Kelly Treves took the loss for Bellevue Wolverines Varsity. She surrendered eight runs on seven hits over six innings, striking out three. Kama Boswell, Kendall Mecham, Morgan Pingree, and Treves each collected one hit to lead Bellevue Wolverines Varsity. Mead went 3-for-3 at the plate to lead West Seattle in hits. West Seattle was sure-handed in the field and didn’t commit a single error. Sallas had the most chances in the field with eight. Bellevue Wolverines Varsity fell behind early and couldn’t come back in a 19-9 loss to Lake Washington on Friday. Lake Washington scored on a single by Hailey Menssen, a walk by Clair Towey, a double by Amy Chen, a walk by Abigail Mills, and a double by Anastasia Kotsakis in the first inning. Despite the loss, Bellevue Wolverines Varsity did collect six hits in the high-scoring affair. Unfortunately, Lake Washington had ten hits on the way to victory. Lake Washington fired up the offense in the first inning, when Menssen singled on a 2-1 count, scoring two runs. Bellevue Wolverines Varsity notched five runs in the fourth inning. The big inning was thanks to walks by Kendall Mecham and Mason Mukhar and a single by Kelly Treves. Treves toed the rubber for Bellevue Wolverines Varsity. She surrendered 16 runs on eight hits over four innings, striking out five. Kama Boswell threw one-third of an inning in relief. Claire Seats went 2-for-2 at the plate to lead Bellevue Wolverines Varsity in hits. Lake Washington tallied ten hits on the day. Chen, Kotsakis, and Menssen all managed multiple hits for Lake Washington. Chen led Lake Washington with three hits in four at bats. Bellevue Wolverines opened up scoring in the first inning, when Mason Mukhar homered on the first pitch of the at bat, scoring two runs. Bellevue Wolverines Varsity notched six runs in the fourth inning. Bellevue Wolverines offense in the inning was led by Montana Jones, Dani Baxter, Mukhar, Kelly Treves, and Kama Boswell, all knocking in runs in the inning. Treves was credited with the victory for Bellevue Wolverines. She allowed four hits and one run over five innings, striking out four. Lexi Martin took the loss for Interlake. She allowed five hits and seven runs over two and two-thirds innings, striking out one. Bellevue Wolverines tallied one home run on the day. Mukhar had a homer in the first inning. Bellevue Wolverines Varsity racked up seven hits on the day. Boswell and Mukhar all managed multiple hits for Bellevue Wolverines . Mukhar and Boswell each managed two hits to lead Bellevue Wolverines . Bellevue Wolverines arsity stole ten bases during the game as three players stole more than one. Claire Seats led the way with three. Bellevue Wolverines Varsity didn’t commit a single error in the field. Mukhar had the most chances in the field with four. Ren led Interlake with two hits in three at bats. Bellevue Wolverines Varsity weathered a push by Mercer Island in the fifth inning where Bellevue Wolverines Varsity coughed up four runs, but Bellevue Wolverines Varsity still won 14-6 on Friday. The big inning for Mercer Island came thanks to a single by Jessica Ramseyer, a groundout by Michelle Lyon, and a double by Madeline Rowe. There was plenty of action on the basepaths as Bellevue Wolverines Varsity collected 14 hits and Mercer Island had three. Bellevue Wolverines Varsity got things moving in the first inning, when Kelly Treves singled on the first pitch of the at bat, scoring one run. Bellevue Wolverines Varsity put up seven runs in the third inning. The offensive firepower by Bellevue Wolverines Varsity was led by Claire Seats, Morgan Pingree, Hailey Wright, Montana Jones, Mason Mukhar, and Treves, all sending runners across the plate with RBIs in the inning. Treves led the Bellevue Wolverines Varsity to victory on the pitcher’s mound. She allowed three hits and six runs over seven innings, striking out six. C Larson took the loss for Mercer Island. She went seven innings, allowing 14 runs on 14 hits and striking out one. Bellevue Wolverines Varsity tallied 14 hits. Treves, Kama Boswell, Jones, Kendall Mecham, and MC Tolbert all collected multiple hits for Bellevue Wolverines Varsity. Boswell and Treves each collected three hits to lead Bellevue Wolverines Varsity. Ramseyer went 2-for-4 at the plate to lead Mercer Island in hits. Bellevue Wolverines Varsity and Lake Washington passed the lead back-and-forth on Friday, but eventually Lake Washington prevailed 12-11. The game was tied at nine with Lake Washington batting in the bottom of the fifth when Kelly Treves induced Hailey Menssen to hit into a fielder’s choice, but one run scored. Mason Mukhar drove in five runners in the loss. Mukhar drove in runs on a single in the first, a double in the fourth, and a single in the fifth. Lake Washington opened up an early lead in the second inning when Jamie Pippin grounded out, scoring one run. After Bellevue Wolverines Varsity scored three runs in the top of the fourth, Lake Washington answered with three of their own. Bellevue Wolverines Varsity scored when Mukhar doubled on a 1-2 count, scoring two runs and Treves doubled on a 1-0 count, scoring one run. Lake Washington then answered when an error scored one run for Lake Washington, Menssendoubled on a 1-0 count, scoring one run, and Anonia Norman singled on a 1-2 count, scoring one run. Lake Washington scored four runs in the second inning. The offensive firepower by Lake Washington was led by Lindsay Allan, Haley Brown, and Pippin, all driving in runs in the frame. Norman led the Lake Washington to victory on the pitcher’s mound. She surrendered 11 runs on 15 hits over six innings, striking out seven. Anastasia Kotsakis threw one inning in relief out of the bullpen. Treves took the loss for Bellevue Wolverines Varsity. She lasted six innings, allowing 12 hits and 12 runs while striking out four. Bellevue Wolverines Varsity tallied 16 hits. Montana Jones, Mukhar, Treves, Morgan Pingree, and Kendall Mecham all collected multiple hits for Bellevue Wolverines Varsity. Jones went 4-for-5 at the plate to lead Bellevue Wolverines Varsity in hits. Lake Washington racked up 12 hits on the day. Brown, Kotsakis, Abigail Mills, Menssen, and Meliena Carelli each had multiple hits for Lake Washington. Brown led Lake Washington with three hits in four at bats. 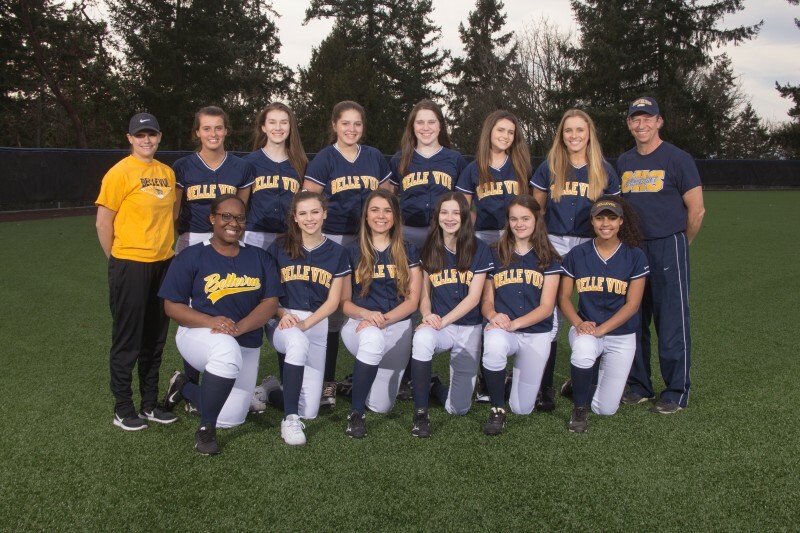 Kelly Treves would not be denied at the plate when runners were on base on Wednesday, driving in five on two hits to lead Bellevue Wolverines Varsity past Sammamish 13-2 on Wednesday. Treves drove in runs on a single in the first, a home run in the second, and a sacrifice fly in the fifth. Bellevue Wolverines Varsity got things started in the first inning when Kendall Mecham singled on a 3-2 count, scoring one run. Sammamish knotted the game up at two in the bottom of the first inning. C Hamada drove in one when she singled. Bellevue Wolverines Varsity pulled away for good with three runs in the second inning. In the second Treves homered on the first pitch of the at bat, scoring three runs. Bellevue Wolverines Varsity put up four runs in the fourth inning. The offensive onslaught came from a single by Kama Boswell and an error on a ball put in play by Morgan Pingree. Treves was the winning pitcher for Bellevue Wolverines Varsity. She allowed six hits and two runs over five innings, striking out four and walking one. S Cabales took the loss for Sammamish. She allowed 13 hits and 13 runs over five innings, striking out five. Bellevue Wolverines Varsity racked up 13 hits. Mecham, Treves, Claire Seats, and Boswell all managed multiple hits for Bellevue Wolverines Varsity. Mecham went 3-for-3 at the plate to lead Bellevue Wolverines Varsity in hits. Montana Jones led Bellevue Wolverines Varsity with three stolen bases, as they ran wild on the base paths with seven stolen bases. Bellevue Wolverines Varsity fell behind early and couldn’t come back in a 16-0 loss to Redmond on Friday. Redmond took the lead on a groundout in the first inning. The Bellevue Wolverines Varsity struggled to contain the high-powered offense of Redmond, giving up 16 runs. Redmond fired up the offense in the first inning, when Haley Hanson grounded out, scoring one run. A single by Montana Jones in the first inning was a positive for Bellevue Wolverines Varsity. Sophia Viola led things off on the hill for Redmond. She lasted three innings, allowing two hits and zero runs while striking out one. Kama Boswell was on the mound for Bellevue Wolverines Varsity. She surrendered eight runs on one hit over one and one-third innings. Mason Mukhar threw one and two-thirds innings out of the bullpen. Redmond tallied two home runs on the day. Kiki Milloy went yard in the third inning. Jennifer Cummings had a four bagger in the third inning. Claire Seats and Jones each collected one hit to lead Bellevue Wolverines Varsity. Cummings went 2-for-2 at the plate to lead Redmond in hits.